Ottawa/Gatineau peeps, this is for you! 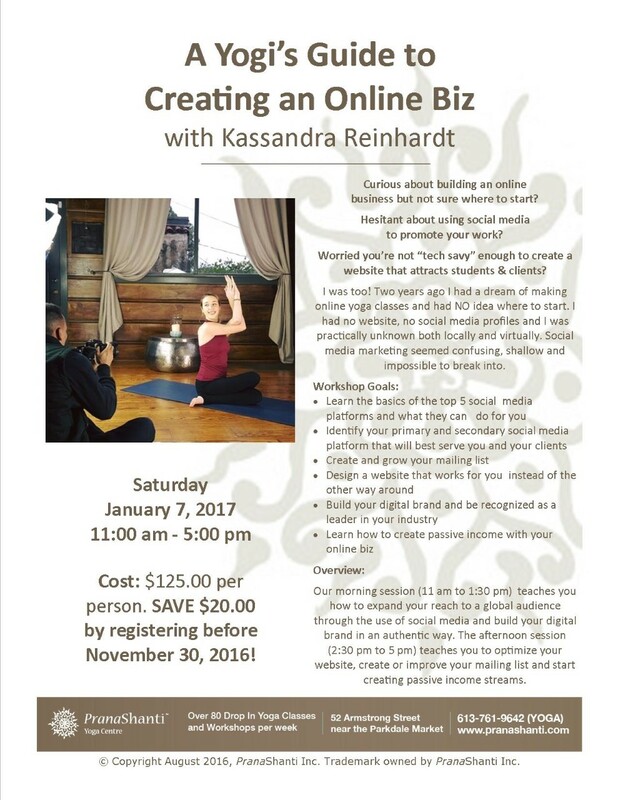 If you're a health & wellness professional curious about bringing your business online, this is a workshop you won't want to miss. This full day session at Pranashanti Yoga Centre is jam packed with information to get you started online so you can reach a wider audience, earn passive income and do more of what you love without burning out! Not in Ottawa but still interested in creating an online business? You can work with me one on one through my consulting services. CLARITY CONSULTATIONS are for clients who do not yet have an online business or have only just begun the process of creating one. It is for people who want to know how to get started and need a clear step by step approach in getting setup. It will provide you with all the information you need to bring your idea to life even if you have little experience with online marketing, website building, lead generation and social media. THE GAP ANALYSIS is ideal for people who already have an online business up and running but want insight into growing it to a larger scale. I will identify areas that could be improved or modified to maximize profits and reach a larger audience. If you're interested in working with me one on one, CLICK HERE.